ABT PRODUCTS: Excellence. Under one roof. Your 1st choice UK manufacturing partner for global OEMs. 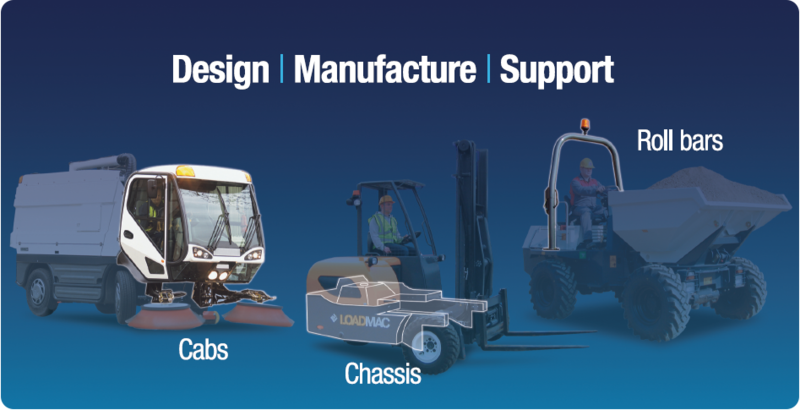 We are the UK’s leading Cab, Chassis and Rollbar Manufacturer. Supplying a complete product solution either as a full sub-assembly, or a finished machine. ABT pride ourselves on working closely with our customers to understand their requirements and the application of the end user. From 25 units to 5,000 per year, ABT can grow to meet your needs. Feel free to contact us or visit our factory. There is no obligation, just free advice and information. Over forty years’ worth of UK manufacturing experience in chassis, vehicle cabins/operator environments, suspension components, rollbars and complex fabrications/assemblies. A complete product solution:in-house CAD design, ROPS/FOPS testing approval facilities and production tooling manufacture. World class manufacturing capabilities from component production, welding, corrosion resistant pre-treatment, painting, through to final assembly and delivery. Total supply chain management – from glass door furniture; from engines to wiring looms; from axles to climate control systems:we manage your supply chain requirements so you do not have to. Plug and Play Our complete focus is to supply a “a plug and play” service, to deliver your product to the quality standards you require, at the right price, when and where you need it throughout the world so you can satisfy your customers. Worldwide Delivery of Product either finished goods or your spare requirements – leave it to us. Autophoretic The gold standard of rust protection (coat internal component surfaces without melting plastic/rubber components) Provides a uniform covering, corrosion resistant , huge capacity , highly resistant with global acceptance. ON HOLIDAY? NOT EVERYONE ABT! ABT exhibits at Surface World 2013! We are the UK's leading Cab, Rollbar and Chassis Manufacturer. ABT has over forty years'worth of manufacturing experience in chassis, vehicle cabins/operator environments, suspension components, rollbars and complex fabrications/assemblies.